Injections of the hormone estrogen may decrease a female’s chance of binge eating disorder, according to new research published in the Journal of Clinical Investigation. Well, it does (for sure) if that female is a mouse. "Previous data has shown that women who have irregular menstrual cycles tend to be more likely to binge eat, suggesting that hormones in women play a significant role in the development or prevention of the behavior," Dr. Yong Xu, lead study author and an assistant professor of pediatrics at Baylor College of Medicine in Texas, said in a press release. "When estrogen is high, binge eating is inhibited, but when estrogen is low, binge eating becomes more frequent. Using mouse models, we set out to see what the effects of estrogen were on binge behavior in female mice." Since existing science has shown long-term estrogen therapy can increase risk for breast cancer, the mice in this study were injected with a combination of estrogen and the peptide GLP-1. This, according to developers from Indiana University, is a safer alternative to a full-dose of estrogen, since it doesn’t go near the breast tissue. And in the mice models, Xu found the injections were activating the estrogen receptor in the serotonin region of the brain, or the region of the brain that’s been associated with binge behavior. 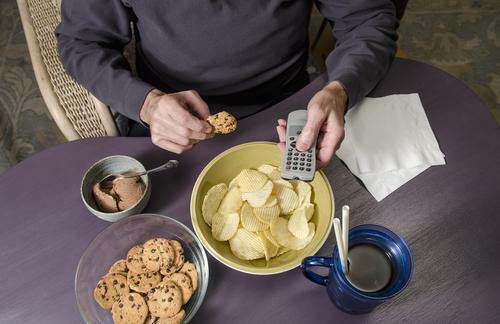 More importantly, this receptor mediates the effect of strong to suppress binge eating. "There are a few studies showing that binge patients tend to have decreased GLP-1 in their blood, but nobody had shown that GLP-1 suppresses binge eating in animals or humans until now," Xu said. "We showed that these two things, estrogen and GLP-1, work together to decrease binge eating and that GLP-1 can carry estrogen to this specific site to produce a benefit, but bypasses the breast tissue." Before you write off the mice-inspired research, know this: Prior research has shown women with an irregular menstrual cycle are more likely to binge eat. This supports the idea that low levels of estrogen, what the injections work to correct, can increase the likelihood of that binge behavior. Eating disorders, like binge eating, anorexia, and bulimia, don't have a single cause. According to the National Institutes of Health, they're, more often than not, a combination of biological, behavioral, psychological, and social factors. Nutrition, a reduction in exercise, and means to stop purging behaviors are the foundation of succesful treatment. Perhaps further research will recommend adding estrogen therapy.